This fully-revised A4 spiral bound road atlas of Europe contains clear, detailed road mapping, route planning maps, large scale road maps of the Ruhr and Rhine, city through route maps, city centre plans and a comprehensive place names index. It is your ideal companion for driving in Europe. Scale of main maps 1:1,000,000 (1 cm to 10 km / 1 inch to 16 miles). MAIN FEATURES Clear, easy to follow road maps at a scale of 1:1,000,000. Euroroutes and motorways are easily distinguished on the mapping. The maps also show international road classifications, road distances in kilometres and relief is shown by attractive layer tints. 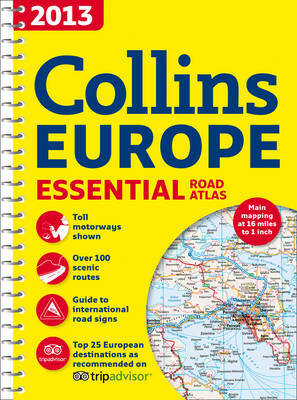 INCLUDES * Route planning maps. * Over 100 scenic routes shown. * Toll motorways shown. * Guide to international road signs, driving advice and useful internet links. * Route maps of 64 major cities. * Street plans of 16 major cities. * Locator diagrams on each page to help you navigate. * More detailed road maps extending from Amsterdam to Munich, making route following easier through this densely populated area. * Top 25 European destinations as recommended on tripadvisor® AREA OF COVERAGE The mapping extends from the North Cape (Norway) to Gibraltar and from Ireland to east of Moscow. Also includes Iceland and Cyprus.